In the Assen round Pirelli will try to get further confirmation on the performance shown at Motorland Aragón from the special solutions developed for the two different categories in the premier class After the excellent performance shown during the last round of the eni FIM Superbike World Championship, the solutions developed specifically for the Superbike and the EVO classes have been confirmed by Pirelli also for the third round that will take place next weekend at Assen. The Italian tyre manufacturer, although satisfied with the excellent results obtained at Aragón wants to acquire more information on the two new solutions, each dedicated to one of the two classes, to assess their performance under different conditions of temperature and asphalt. 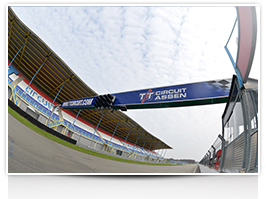 TT Circuit Assen from tyre point of view: a fast and technical circuit The TT Circuit Assen is considered one of the most difficult tracks of the championship and is nicknamed ‘The Cathedral of Speed’ due to the high average speed riders can reach. The circuit was built in 1925 and now measures 4,542 metres with 11 right-handers and 6 left turns. Although not particularly stressed from a thermal point of view, track tyres must still be able to provide to the rider great precision and a lot of directional stability. In April, it is easy to meet varying weather conditions and cooler temperatures and this is another factor to take into consideration. The Assen allure lies in this series of long and constant speed turns, slow U-shaped turns with braking and sudden acceleration, quick chicanes and long turns with strong acceleration coming out of them, with the bike still leaned over. Made up of a very high bituminous percentage, the asphalt at Assen represents a strong correlation between how aggressive the track is and the air temperature. This means that with low temperatures the rear solutions can suffer from problems with tearing (by now well known as cold tearing), particularly in the event of soft solutions (and therefore less resistant) and when the track is poorly rubberised, typically during the Friday sessions. The Pirelli solutions for Superbike and Supersport classes: Pirelli comes to the third round of the eni FIM Superbike World Championship carrying a total of 4619 tyres that meet the needs of all classes. Of these tyres 2036 are dedicated to Superbike riders, 1326 for Supersport, 464 are those for the Superstock 1000, 585 for Superstock 600 and 208 for the European Junior Cup. In Superbike each rider for the entire race weekend can count on a supply of 76 DIABLO™ Superbike tyres including 35 front and 41 rear. All available options are already known to the riders because they were already available at Aragón round. The goal of Pirelli is now to see them in action on another circuit in order to explore further their versatility. At the front three alternatives: the standard SC1 and SC2 and the development SC1 S1699, which debuted successfully at Aragón where it was chosen by about 80% of the riders lined up on the grid because it offers greater support for the approach to the turns in favour of a better steering precision. Four options in total at the rear, two in common to all riders and a third one which is different for Superbike riders and for those of the EVO class. The two solutions available for all riders are the standard SC0 solution ideal for soft and smooth asphalt as well as high temperatures and used in Race 2 in Spain. Also the standard SC1, in medium-hard compound, which is positioned midway between the soft solution and the hard, has been used by a lot of riders in Superbike Race 1 at Aragón when temperatures were lower. The third and last solution for the Superbike riders will be the development SC1 S1185 which debuted at Aragón as an alternative to the standard SC1 in comparison to which ensures an even more linear wear and a better performance, and that has been used by almost all the riders in Race 1. In the EVO category the riders can once again count on the valid development SC0 R1120, able to offer a greater resistance to consumption and which has been very popular in the last round in the Iberian peninsula. In addition, the 20 riders who will enter the Superpole on Saturday as always will have one qualifier tyre in very soft compound that allows 1-2 laps at maximum performance. 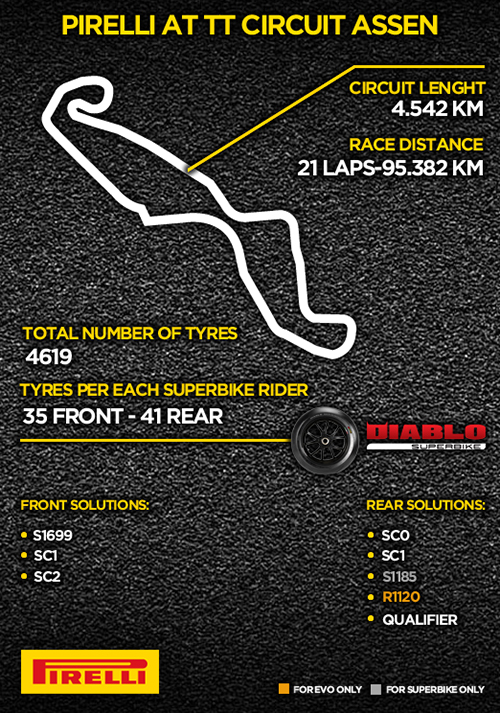 In Supersport, DIABLO™ Supercorsa SC tyres in the allocation of each rider will be 51 divided in 23 front and 28 rear. As in the first two rounds the standard SC1 and SC2 will be the options for the front. At the rear in addition to the standard SC1 riders will find the S0624 specification, an alternative to the standard SC1 which as been already seen in action at Aragón, and the development SC2 R1288 in hard compound and more protected in comparison to the SC1 in case of low temperatures. In addition to slick tyres, DIABLO™ Wet intermediate tyres and DIABLO™ Rain tyres for wet are provided for all classes. Giorgio Barbier’s memory: the year was...2001 “Assen is perhaps one of the few circuits specifically designed for two-wheelers but over the years it has undergone several changes ," says Giorgio Barbier, Pirelli Moto Racing Director "2001 was the last year in which the races were held with the original and a little more than six kilometres long layout which make this circuit known as The Cathedral of Speed. Till that time Assen has always been a circuit where to win you really needed great courage because the track was still without curbs and with water channels not so far from the escape routes. The most beautiful overtakes you could see only in the fast parts but it was necessary for very great precision to avoid the risk of ending up out of the track. The latest important change was made in 2006 and saw the elimination of the entire first part of the circuit, very fast especially for a modern layout, which has reduced almost 1,500 metres the length of the track. Probably now the circuit has lost some of the charm that had initially but has, without doubt, become much safer." 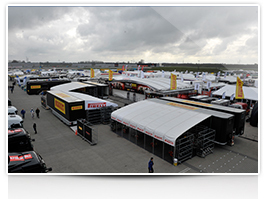 The 2013 Pirelli statistics for TT Circuit Assen: • Total number of tyres Pirelli brought: 4848 • Number of solutions (dry, intermediate and wet) for the Superbike class: 5 front and 7 rear • Number of solutions for the Supersport class (dry, intermediate and wet): 4 front and 5 rear • Number of tyres available for each Superbike rider: 34 front and 40 rear • Number of tyres available for each Supersport rider: 25 front and 29 rear • Superbike Best Lap Awards won by: Tom Sykes (Kawasaki Racing Team), 1'35.893 (Race 1, 2nd lap) and Eugene Laverty (Aprilia Racing Team), 1'36.085 (Race 2, 2nd lap) • Supersport Best Lap Awards won by: Fabien Foret (MAHI Racing Team India): 1'38.768 (7th lap) • Temperature in Race 1: air 12° C, asphalt 15° C • Temperature in Race 2: air 15° C, asphalt 23° C • Maximum race speed reached by Pirelli DIABLO™ Superbike tyres: 293.3 km/h, Eugene Laverty (Aprilia Racing Team) in Race 1 at 21th lap • Maximum race speed reached by Pirelli Diablo Supercorsa SC tyres in Supersport race: 258.8 km/h, Michael Vd Mark (Pata Honda World Supersport) at 3rd lap.